In South Pacific Island countries many coconut palms are of an older age and now provide only low nut yields. Identified as senile, these palms are ready for removal to be either replaced, or the land converted to alternative use. One established Fijian company, Pacific Green, produces exotic tropical style furniture from coconut palm logs extracted from senile palms. 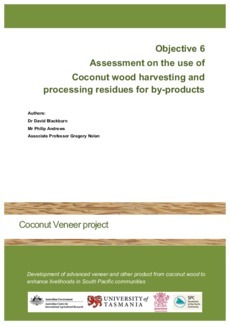 To expand the range of products and potentially add value to the coconut wood product supply chain, a rotary peeled veneer industry is now being investigated as an option for the use of logs extracted when the senile palms are harvested in future. If this option proves attractive, strategic operations will need to be considered to address an increasing demand for both saw- and peeler-logs. The distribution of vascular fibre bundles longitudinally arranged throughout parenchyma ground cortex of a coconut palm stem is a key determinant of the palm’s wood properties. The outer periphery of the stem and the lower stem has a higher basic density more suited to solid wood products (Bailleres, H., et al. 2010). This means after palm harvesting operations for suitable solid coconut wood products, a large volume of lower density palm material remains. • A residential and industrial fuel source. • A growing medium for mushrooms. • A growing medium for plants. • A feedstock for biochar pyrolysis. • A feedstock material for compost production. This report presents findings and conclusions drawn from the trial studies, and the literature reviewed.